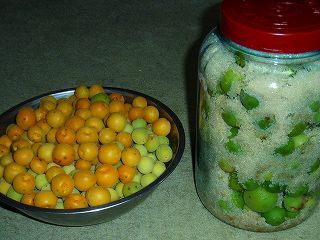 The plum tree (Ume) is generally used for the pickled plum, the sugar pickle, and the white liquor pickle (plum wine). The medicinal effect is a lot of health food that is. Cultivation can be hurried harvested also with no agricultural chemicals very easily. A lot of useful organic acids such as the succinic acid, the citric acid, the malic acids, and tartaric acids are contained in fruits of the plum tree. It is necessary to note it because the cyanogenetic glycoside of poisonous (cyanogen) is included in Ome of immaturity. Especially, please note that the seed of the plum tree (benevolence) contains the cyanogenetic glycoside hundreds of times the flesh (cyanogen). Food poisoning might be caused when it eats the nucleus (benevolence), and it die. There is working that resolves the lactic acid and excretes the citric acid of the plum tree. There are an anti-bacterium and a bacteriocidal action for bacteria and bacteria. Constipation and diarrhea are canceled, and working of the stomach and intestines is helped. The citric acid of the plum tree has working that smoothly renews and excretes the waste matter. If sunshiny is good, the plum tree can be easily grown even in thin land and dry land. It is likely not to fail even if the beginner suitably plants it. In general, the plum tree is planted at the early spring. It digs up the large pit, a lot of compost and humses are put, the drainage is improved, and it makes it to the fertilizer. The root is combined with the soil, the 1-2th grader grafted tree seedling is planted, and the sapling of the plum tree is put up. Afterwards, enough and the watering are done. The plum tree will be pruned in winter. Because the truth doesn't become a long branch so much as for the plum tree, it prunes it to make it to a short branch. When planting it while thinking which extent to make the height of the entire tree, it cuts it by about 1m. 1/3 of the new branches is cut in the following age. To often arrange several branches that become main branches in the balances afterwards, it prunes it. The branch is self-assertive when leaving it, and the tree of the plum tree is pruned by thinking about ventilation and sunshiny on the nether branch because it is unnoticed. The plum tree is harvested in around the beginning of June. Because I suitably plant and hardly maintain it, it starts from cutting undergrowth first of all. Because a true size is different depending on the kind of the plum tree, it harvests except the container each kind. A left photograph is a sugar pickle of a small plum tree that often ripens and big plum tree. A small plum tree is made a pickled ume. The sugar pickle of the plum tree can be made very easily. Plum tree 2kg and sugar 2kg of big are alternately put in [hirokuchibin] of five liters. Only sugar is taken above. I am using a little black sugar of soft brown sugar though the crystal sugar is used for sugar usually. It is because it is possible to make it even a little cheaply because a large amount of reasons are made. The moisture of the plum tree will go out in about three months, and the sugar pickle of the plum tree is ready. When this liquid is thinned to about five times and drunk, it is ready of the plum tree juice. It will eat the truth of the plum tree later. It comes to ferment like plum wine when putting it too much long. Even if I drink this, I occasionally get drunk. It is very weak to alcohol. You may eat actually as it is, and after the seed is taken, the plum tree made a sugar pickle is made plum tree jam. The flesh and the sugar of the plum tree are made couple about 1, it cooks with the gas set to medium, and it stuffs. The plum wine making is also easy. The fruits 500g and the crystal sugar 400g of the plum tree are soaked to shochu (white liquor) one liter. Plum wine is ready when the crystal sugar melts and it disappears. In the Chinese medicine, soup "[Sanmeikou]" that squeezes the flesh of Ome is used as a medicine in intestines. As for a strong antibacterial activity of the plum tree, the effect can be expected also of bacillus diarrhea. An extract of plum on the market and the plum vinegar are thinned with the hot water and it drinks if it easily makes it. Or, it infuses and it drinks a half amount of the pickled ume in the water of 300ml. When diarrhea improves it, a dry pickled ume is made a powder, it sprinkles on rice gruel, and it eats. Even if the plum tree is soaked to the pickled scallion vinegar, it is easy. Fruits 2kg of the plum tree is soaked to the pickled scallion vinegar 1.8 liters. Sugar 1kg is added to this. Please add and subtract the amount to become a desired taste.